I think my daughter Esmé is extraordinarily unique–from her tiny pudgy feet that she likes to stuff in her mouth, to her beautifully lashed blue eyes and outrageously untamed hair. It’s a mom thing. I guess it is a symptom of loving another person more than life itself. But my daughter is also surprisingly unusual in in another, more scientific, way: in her genes. In November 2011, when Esmé was around 10 months old I wrote another article, Beyond Wanting to Know, about why we were considering stopping genetic testing. At the time we had just completed Esmé’s microarray, which had come back showing nothing by way of genetic changes. We did understand that Esmé probably still had a genetic disorder. It was all rather obvious. She was unable to roll over or sit up. She was almost silent, tube-fed, and having seizures (although we didn’t know it then). However, at the time, as I admitted in the article, I still had some deep dark hope that she would grow out of all of these challenges–a hope that was threatened by my need to understand Esmé’s health, to find genetic answers. A hope that was complicated by the limits of what I understood, even then, that genetics might be able to tell us. Admittedly, I do have a deep desire to search the ends of the Earth for any answers about Esmé’s health. It is a very quiet and private desire. I do want to know…”Knowing” may mean that we find some small mutation that no one else has that may or may not be significant. “Knowing” may mean more questions. Scratch that, knowing certainly means more questions. I had no idea how far the following three and a half years would bring me in search of answers–traveling geographically to Europe and the west coast of the US in order to meet with researchers from as far away as Australia–seeking out geneticists who spend their time at the cutting edge just beyond what is accepted about genetics. 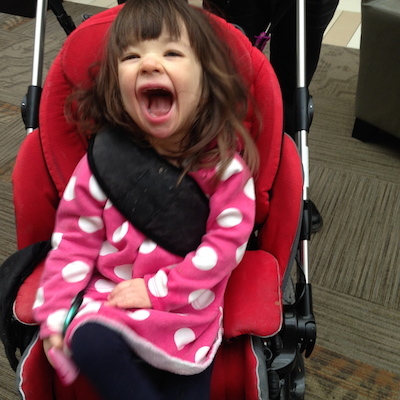 About a year after writing that I wanted to stop genetic testing, Esmé was in the midst of seizures that were spiraling out of control, not responding well to any of the medications we had tried. We found ourselves again wanting to try to know more–even if knowing more meant more questions. We hoped that any insight into her condition would help us better treat her. We had no idea how many more questions the testing would wind up raising. In the fall of 2012 we ran a new form of genetic test, which looked at the over 30 genes (then) known to cause infantile epilepsy. The innovation with this test was that the genes could be tested simultaneously, rather than one after another, which would have taken years. In December we received a call explaining that the test had found a single small mutation in a gene associated with infantile epilepsy and developmental delay almost exclusively in girls. Our neurologist explained that the gene was called PCDH19 and that Esmé’s specific mutation had never been reported before, so it was unknown whether a mutation in the location of Esmé’s was expected to be pathogenic (disease-causing). At the time our doctors felt it was more likely than not at least a partial explanation. So, we took our place somewhere around the 100th documented case of PCDH19 Epilepsy. What little information I was able to find on it told me that there were aspects of this disorder that seemed very much like my daughter–cyclical clustering seizures with cyanosis, behavioral differences–but among the girls I learned about over the coming months, essentially all of them lacked the medical fragility, multi-system involvement, extremely low tone, and severe developmental delays that I saw in Esmé. While dealing with truly devastating epilepsy and multiple hospitalizations, the girls who had only PCDH19 Epilepsy were walking, running, talking, and eating. They did not align with the picture of my darling two-year-old daughter, who was still not sitting up, babbling, or eating by mouth. However, this was the only lead we had to explain Esmé–so I took it and ran with it. I became increasingly involved in the PCDH19 community, starting a foundation, the Cute Syndrome Foundation, to raise money for rare disorders that, for its eighteen months, focused only on PCDH19 research. In that time we funded about $120,000 worth of PCDH19 research and awareness projects. For most of that time, however, we knew that this was unlikely to provide complete answers for Esmé. Especially as more and more cases of PCDH19 were diagnosed, the gap between Esmé’s symptoms and the symptoms of individuals with only PCDH19 Epilepsy became increasingly evident. 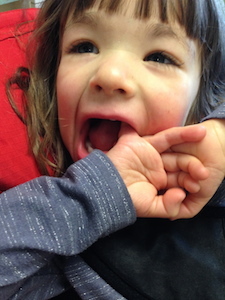 So about two years after our infantile epilepsy panel testing, we started looking again, digging into Esmé’s genes–this time with whole exome sequencing–to see if we could come up with some more answers…perhaps find something else we could do to help Esmé. We assumed that she likely had PCDH19 Epilepsy and a second disorder that affected her muscles, movement, and some of her internal organs. We didn’t expect to find a second mutation in a gene associated with infantile epilepsy–but that is what we found. The exome showed that Esmé had a second mutation of unknown significance in the gene SCN8A–a recently discovered gene associated with intractable epilepsy, movement disorders, and severe developmental delay. The test results also stated that Esmé’s PCDH19 mutation had been reclassified as unlikely to be pathogenic. Fortunately, through my work with the Cute Syndrome Foundation I had the chance to form relationships with a number of clinicians and researchers who work with rare genetic epilepsies. So, I started to get in touch with some of these researchers to see what they thought about this new information. Interestingly, there seemed to be a degree of disagreement about whether one or the other or both mutations were significant in Esmé’s case. There was also a lot of suspicion about what else might be causing her symptoms. Everything we have discovered so far has raised more questions, and my daughter’s genes are truly putting scientific knowledge to the test. Understanding whether or not a particular mutation within a gene should be disease-causing is a complicated process. It involves theory about what parts of the gene are very similar across different species, what amino acids are interchanged, and how a mutation might alter the protein produced by the gene. It can also involve functional tests and models to actually measure the effect of the mutation. Increasingly, however, it also requires scientists to think bigger than the individual gene–to see how different genes might interact. It also means looking in new places in human DNA for answers that may have been previously overlooked. So, for now, we will wait. We have to wait. We will wait while science continues to expand its understanding of the human genome–through her and others like her–into a place that will begin to answer some of the questions we have about Esmé’s life, health, and future. And just as before…only time will tell. But for now, I suppose, I am content to understand the most important thing of all: Esmé is certainly one of a kind. As we all are. In that way, I find myself back where I started…beyond wanting to know. 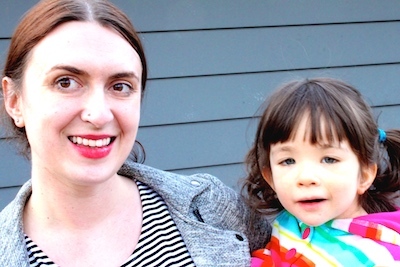 Hillary Savoie, PhD, has blogged about life with her daughter Esmé, who is medically-fragile, since September 2012 on The Cute Syndrome Blog. Hillary’s first short book, Around And Into The Unknown, tells the story of her family’s journey through Esmé’s genes in an effort to find a diagnosis for Esmé. Around and Into the Unknown is available as an individual e-book and as part of the paperback anthology Travel 6 of 1. Her second book, Whoosh, also by Ponies + Horses Books, will be out in July 2015. Hillary is also the Founder and Director of The Cute Syndrome Foundation, which is dedicated to raising research funds for and awareness of rare disorders like PCDH19 Epilepsy and SCN8A Epilepsy. She is also the Chief Communications Maman at the Feeding Tube Awareness Foundation.